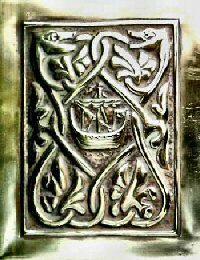 Brass casket with repousse decoration of scrolled leaves, beasts' heads, and Viking ship. 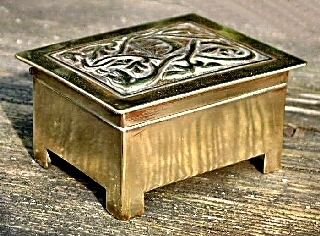 Approximately 9cms x 7cms x 5cms, circa 1910. 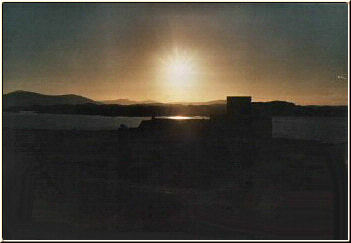 Alexander Ritchie, Iona. The design motifs taken from a medieval gravestone originally in the Reilig Odhran, now in the Iona Museum. 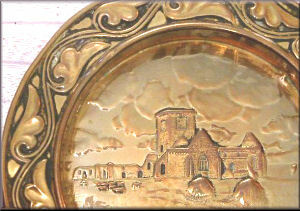 Rare brass repousse salver with hanger attached to the reverse. Diameter approx 12". The foliate design is taken from the stone "The Four Priors", which can be seen on the Carved Stones section of this website. Date c.1905-1910. 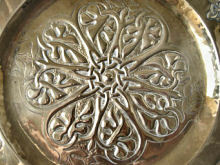 Brass repousse decoration plate, diameter 6" approx. 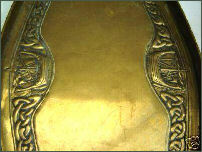 Typical foliate decoration around the rim, taken from medieval Iona stonecarvings. 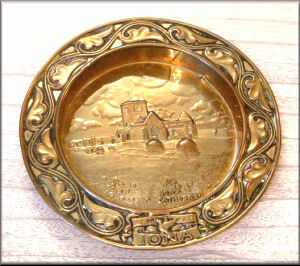 The centre has a repousse picture of Iona Abbey when it was still roofless, and on the rim there are the words 'Peace to Thee, Iona'. An early AR piece c.1905-1910. 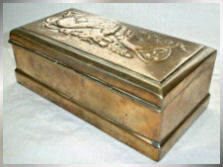 Very rare repousse brass Alexander Ritchie casket c.1905. The dimensions are 7.75" x 4" x 3" and on the top it is signed by Ritchie. The desing is of two mythical beasts, which can be seen carved in stone on one of the medieval Iona Abbey pillars. Beneath the beasts are the words 'Iona Cathedral'. 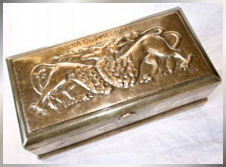 The inside of the casket is tinned. 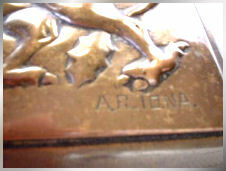 A wonderful example of signed AR brasswork. 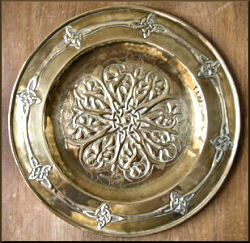 Large brass double-handled salver, c.1910, with repousse knotwork border and typical Iona Viking ship decorations on either side. 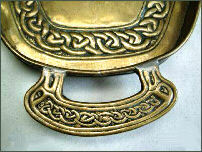 The handles have knotwork decoration, and finials ending in stylised Celtic birds. A rare piece.